Prof. James H. Charlesworth of Princeton Theological Seminary has just announced a rather startling observation regarding an inscription on an ossuary discovered in Jerusalem that appears to be a stick figure of a man and a fish. Charlesworth argues that the stick figure contains four letters in paleo-Hebrew that spell out the name YONAH (Jonah) —Yod, Vav, Nun, Heh. 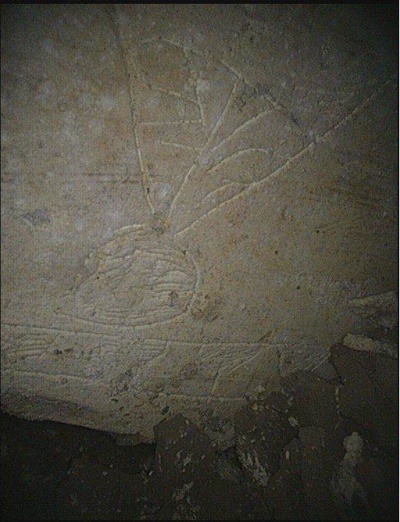 James Tabor has posted photographs on his blog, which highlight the possible Hebrew characters. This entry was posted in Jonah and tagged Bible, Hebrew, Old Testament, Paleo-Hebrew, Prophets. Hi Steve. See http://goo.gl/pqYNW for a summary of the considerable evidence against this interpretation. As far as I can tell, no scholar believes this is a fish except for Charlesworth, Tabor and Jacobovici.